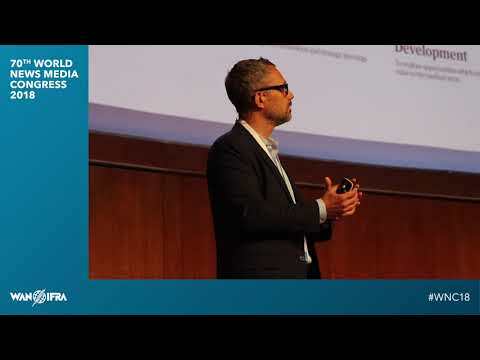 David Pemsel, CEO of Guardian Media Group on stage at WAN-IFRA's 70th World News Media Congress in Estoril, Portugal. Photo by Ricardo Lopes for WAN-IFRA. So, how did all this happen? David Pemsel took over the reins as CEO of Guardian Media Group in July 2015, shortly after Katharine Viner was named the first female Editor-in-Chief. This all came at a time when it looked like the Guardian was on the brink of capsizing. In a candid presentation at the World News Media Congress in Estoril, Portugal, Pemsel outlined the changes they instituted in order to plug their losses and right the ship. First, they came up with a clear and concise strategy. How to build relationships with readers? How to build this relationship into a financial one? How to navigate the new advertising world, i.e. programmatic, etc? How to control costs and break-even in three years? While he said they rejected the idea of putting up a paywall because of concerns that it would limit the reach of the Guardian's journalism, it was essential that they get readers to contribute financially somehow. “We started off in 2015 using different areas of the site to simply say to people 'This is the reality and the economics of the news business right now. You're currently using it for free. We don't want to tax you for consumption, so would you possibly mind if perhaps just today make a financial contribution to this wonderful journalism that you enjoy?' ” Pemsel said. Today, there are more than 800,000 people helping to pay for the Guardian's journalism either as subscribers, members or contributors. Internally, the Guardian also made efforts to control costs, and as with so many other publishers, there were staff cuts in both the UK and US as well. In time, as stability and sustainability increased, Pemsel said they also began to look at how they could better prepare for the future. They launched GMG Ventures with a fund of US$ 50 million and a team that looks to make investments in businesses that can either help to accelerate the Guardian's own plans, or disrupt them. Pemsel said this means things like AI, voice, advances in Virtual Reality, etc. “There's a danger in focusing solely on breaking even that you don't look around the corner, and Ventures is allowing us to do that,” he said. Furthermore, he said they are also regularly creating teams within the Guardian to work on a variety of projects across divisions. The journey to break evenEach quarter, Pemsel said he and Viner "reset the entire business. We use a product methodology called OKRs – Objectives and Key Results. We set the clear target. We put cross-divisional teams together. We give them a focus of what they need to do on the project. And we give them the autonomy to just get on with it."